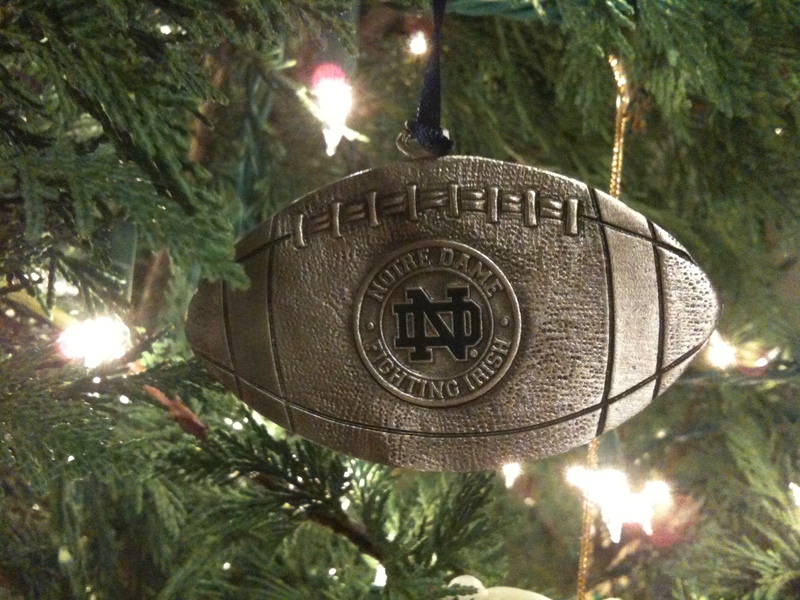 This seems like the perfect night to give you the story of our 2008 Christmas ornament. You'll understand why as I proceed. I turned 30 years old in 2008. A dubious celebration in it's own right made more odd by the fact that I found myself suddenly between jobs. My wife, in what will go down in the history of my life as one of the best presents ever, arranged for us to attend a Notre Dame home football game to celebrate my birthday. Not only that but we actually stayed on campus for the weekend. She made contact with a Professor who allowed us to use his and his wife's tickets and stay at their on campus home. Of course they received monetary compensation for this but we did make some new friends in the process. So aside from once again moving our family to another state, 2008 is remembered for the incredible experience we had watching Notre Dame beat Michigan at Notre Dame Stadium. It was a "bucket list" item for me. I have a wonderful wife that I do not deserve. We found the perfect ornament in the massive bookstore on campus. I smile every year I put it on the tree. By the way, this is the perfect night for this post in celebration of the Sun Bowl victory the Fighting Irish just accomplished. GO IRISH!!! 2007 was another crazy year for us. We spent almost the entire year in Atlanta before moving to Charlotte in December. However, that year was defined for us not by our move but what moved us. We had the incredible opportunity to do something that I never thought I'd actually do. In August Anita and I went to Kenya on a ten day mission trip. Our trip was a little different than the typical mission trip. We were putting on a marriage conference for ministers and their wives. What was amazing about this was the cultural change we saw happen. The African culture we experienced was that wives were a property. Even to a Christian Pastor. It wasn't an ugly thing; it was just the way people were raised. Children, livestock, possessions and even wives were the property of the husband of a home. The curriculum we were teaching couldn't have been more opposite to that idea. I'll save the long story but we saw men walk in to the conference with their wives walking very submissively behind them and those very same men standing up and publicly handing over their wallets to those wives. This was a symbolic statement of recognizing them as equals and helpmates. It was amazing. 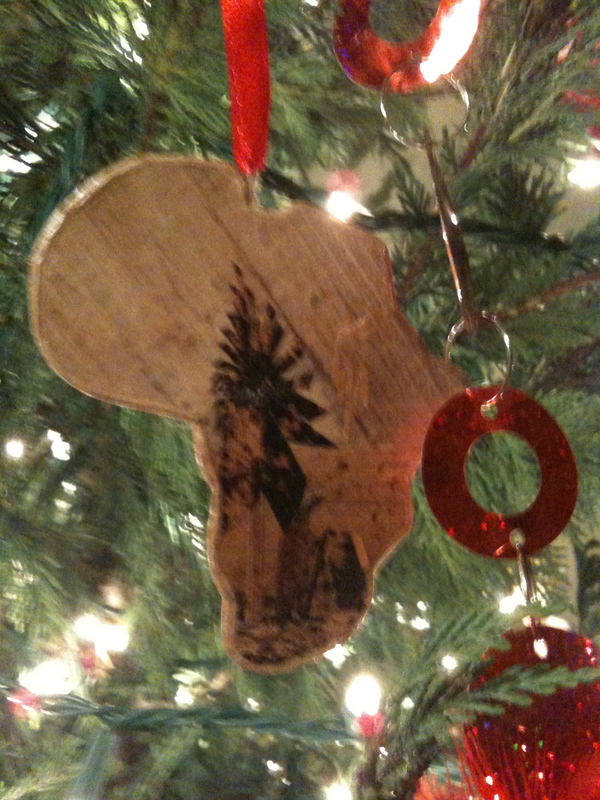 So naturally in our visiting of Nairobi we found the perfect ornament for 2007. I'm not sure if they do this anymore but during my time on staff at North Point Community Church the staff received a Christmas ornament each year. Some were more attractive than others. Actually, while I was there only one out of the four I received was in my opinion "not awesome." As we approached the holidays the staff conversation would naturally gravitate to whether or not we were continuing the tradition and if so, what the ornament would look like. In 2006 Anita and I had two kids. Shopping for an ornament fell to the bottom, if not off, the list of priorities. So we adopted my staff ornament as our annual ornament that year. It's simple and kind of cute. 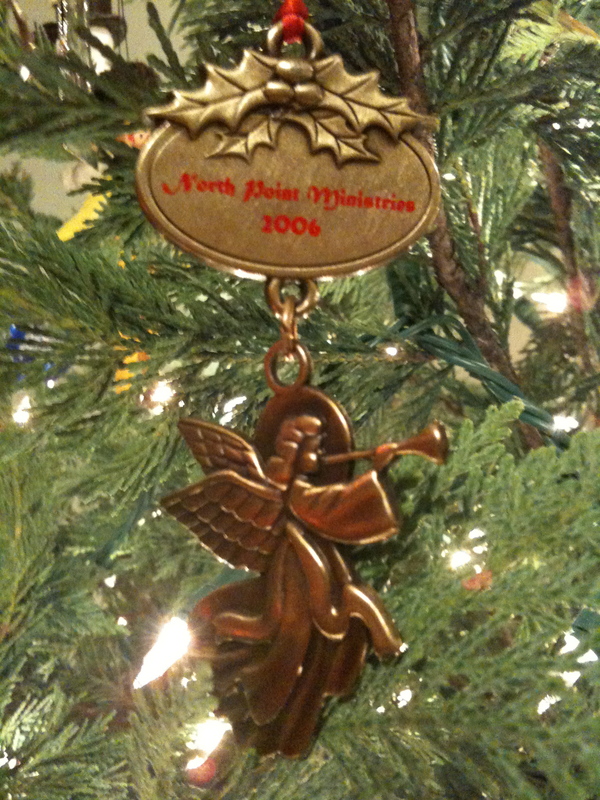 As it would turn out, 2006 would be our last Christmas as a part of the North Point Staff. We of course didn't know it at the time but that little ornament serves as a great reminder of the wonderful privilege we had to be a part of that ministry. I still consider NPCC my home church and the people there to be family. As it so happens, I'm currently in Atlanta visiting some of those very people. I hope you had a Merry Christmas and wish you a Happy New Year. We all have times in our lives when we feel completely helpless. For most people in America this feeling is associated most commonly with health of finances. In 2005 I got a phone call that left me feeling that way financially. To be as transparent as I can, Anita and I have been digging ourselves out of debt for a little while. We both had student loans; we both made some poor financial decisions in college; and we made some poor decisions financially early on in our marriage. Everything caught up with us in December 2005. I still remember standing outside of the restaurant I was eating lunch at with my fellow staff members when I got the phone call informing me that something had to be done immediately….or else. That day I went home and told Anita about it all. I've never understood panic attacks but right there in that moment I had one. It had never happened before and never happened again but it was real and it was terrifying. To shorten a long story, we came up with a solution to the immediately problem but that left us in sad financial shape just before Christmas. We made the hard decision that there wouldn't be any presents under the tree or from us to anyone that year. To a lot of people this is a regular situation. In the bigger picture it really isn't even that big a deal but for parents of an almost two year old and as much as we enjoy doing for others, this was hard. Not long after that decision was made Anita went to a Christmas get-together for some of the Pastor's wives at our church. A story was told about a family who had a similar experience. I don't want to butcher the story so I'll only explain why it's important to this post. The family in the story had only feathers to decorate a tree. Anita came home that night in tears. As she told me the story we both knew what our ornament should be that year. A simple red feather that she brought home that night. We'll always remember how God carried us in spite of our poor decisions. In the end there were presents under the tree for our little girl. We were given several things by friends, family and a local church. 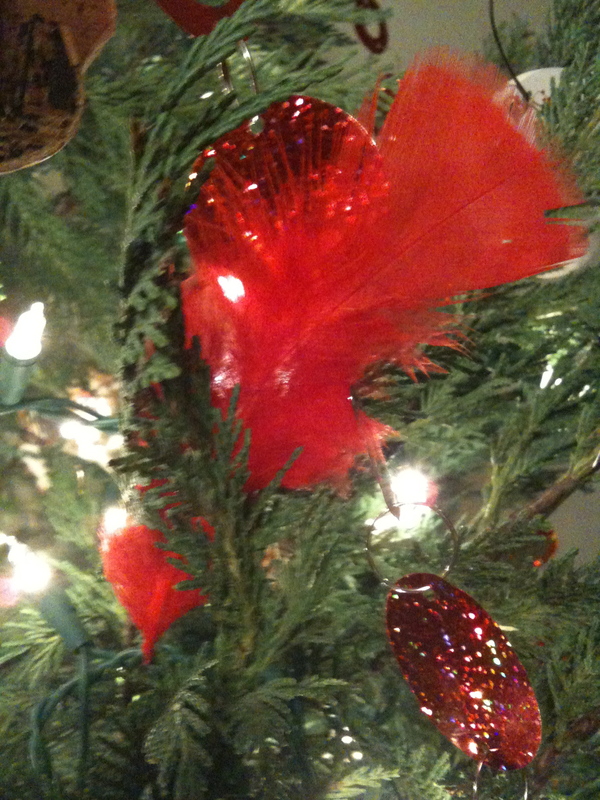 And now each year that little feather reminds us to pass on the generosity that was so lovingly shown to us. 2004 was an odd year for us. We started the year in Mullins. I had kind of promised myself that we'd be there for at least five years. Things obviously didn't turn out that way. Almost out of the blue an unbelievable opportunity arose for us. The church we volunteered at for our year in Atlanta was interviewing me for a potential job. For most people who work for churches the idea of working at North Point Community Church is somewhat of a fairy tale dream. It seemed that way for me anyway. Then I found myself driving to Atlanta with all our earthly possessions on our fifth wedding anniversary. I was actually going to get my dream job. Moving was tough. We lived with family for a while and then we bought a house. So Anita, little Savannah Grace and I would be spending our first Christmas in our very own home. This would also be our first Christmas as parents. We were so excited. Savannah Grace took her first steps at nine months so we couldn't wait for her to walk into the living room Christmas morning and see her presents. It was a good year. 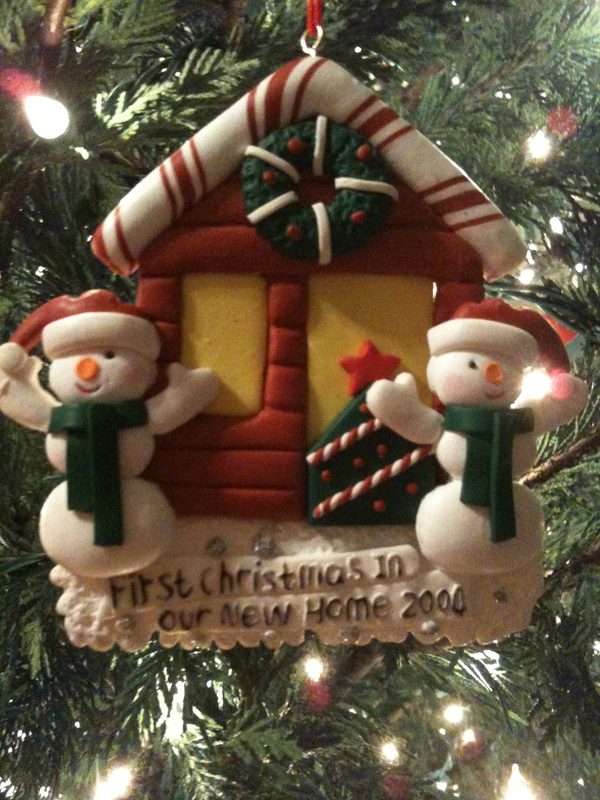 As corny as it might be we got the perfect ornament to remind us of that first Christmas in our new house. 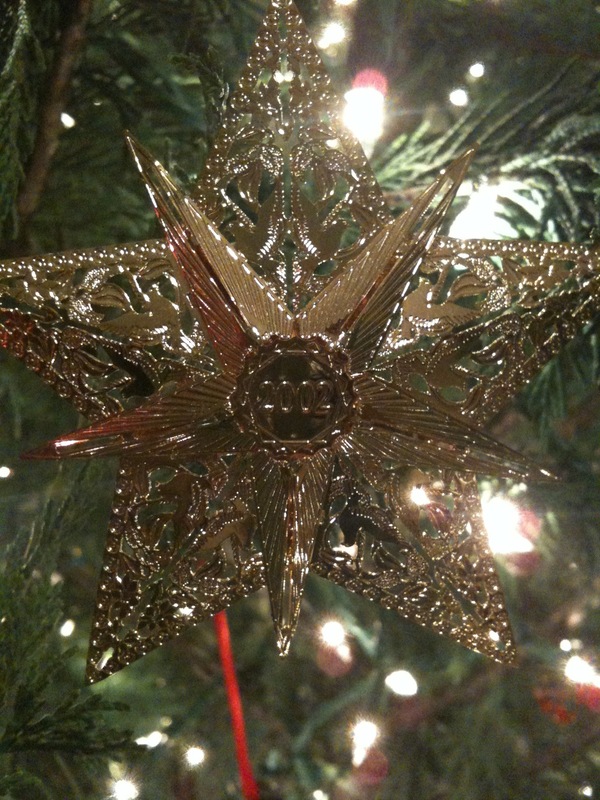 This is the fifth part of a blog series about our annual couple's Christmas Ornament. 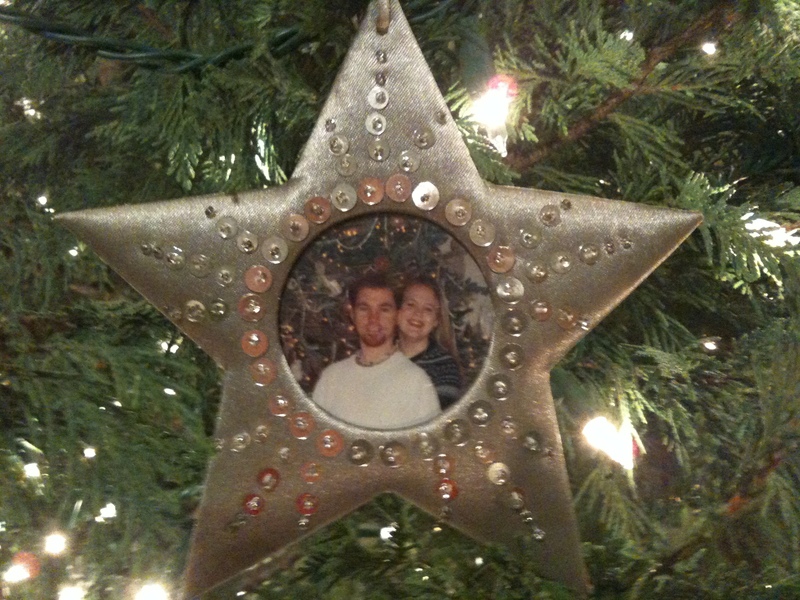 In 2003 we redeemed ourselves with our ornament selection. Since we did such a poor job of representative ornaments in the previous two years, we were determined to find a perfect one this time. I believe we did just that. We were living in Mullins, SC at the time. If you've never been there, you're not missing much. There are only a couple of reasons to ever go. Reason one is the handful of incredible people that live there. We met some wonderful friends that remain close to this day while living in Mullins. The second is for a Bed & Breakfast named Webster Manor. In my opinion it's still one the best places for sweet tea and fried chicken. Outside of that, there's no other reason to ever be in Mullins. It's a dying tobacco town with no plans to be anything other than that. So what in the world would we select for a Christmas ornament? 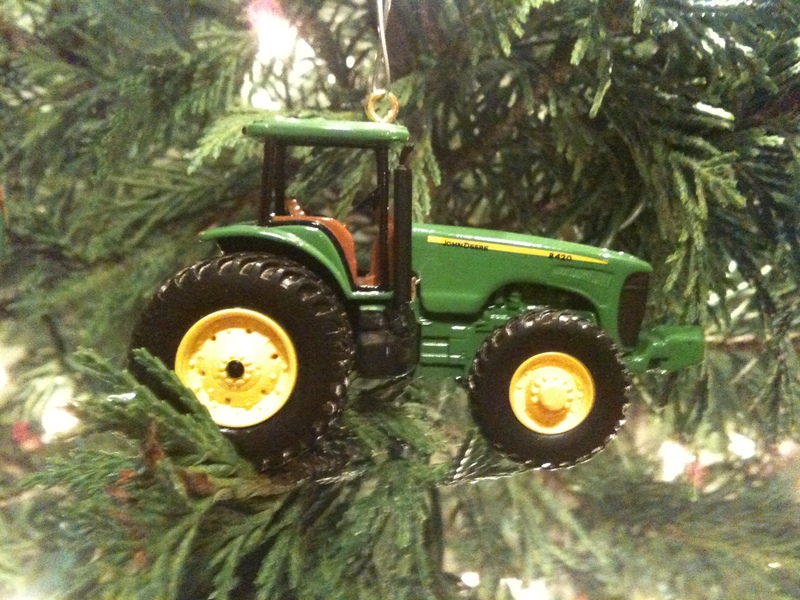 Well, we didn't want a tobacco leaf (which was available in ornament form) so we went with the next best thing…a John Deere tractor. Fitting don't ya think. Every year it's one of my favorite ornaments to put on the tree. Unfortunately, it's also one of the most difficult to find while on the tree. I decided to merge two of the years together. Thus the series of these blog posts became one shorter. Have you ever heard the phrase "I think they punted that one"? It's kind of like "mailing it in." In 2001 and 2002 went from living in Charleston to living in Atlanta (for the first time) then Tennessee and then Mullins, SC. Things in those second and third years were a bit hectic. I had graduated college but Anita was finishing up. I was working two jobs in Charleston and my main job in Georgetown. No, that isn't close to Charleston; but I digress. We were as my good friend Clint Nowery would say, "Ballin on a budget." So it's no surprise that we actually got our 2001 ornament from one of the only stores we went to with any frequency. This beautiful Insert Your Own Picture ornament came from none other than OLD NAVY. It's corny and silly but it does remind us of the humble beginnings we came from. Wait, came from? Well, one day I'm sure we'll be able to say that. In 2002 we flat out punted it. We had no idea what to do for our ornament. Looking back we should have gotten something to represent the state of Georgia since we were there for the majority of that year. At any rate, we just went and got an ornament with the year on it so we'd remember. I still can't believe we did all that moving around. I don't know how we would have made it without our family.